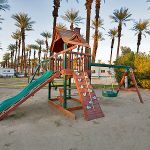 Ask fellow campers about "Thousand Trails - Palm Springs RV Resort" and nearby attractions. We ended up staying extra days due to illness and lucked out as the park is full this time of year. Persistence calling TTrails got an extension. Upon arrival the park was overgrown in many RV sites with tall weeds, some RV spaces had loose rutted sand, many were not very level, and are very close together under the Palms. Power was a little low at times and we had to keep an eye on it. You must be very careful to avoid driving over the sewer inlet. Marked with red posts but ours was only a few inches high. Somehow we lucked out and had one of the better leveled sites. Crew was was working on cleaning it all up but looked shabby for Palm Springs. We camped at Thousand Trails - Palm Springs RV Resort in a Motorhome. 1st time back in 5 years. Still a nice place to stay right off I-10. Level sandy pull thru 30 amp and backin 50 amp full hookup sites. Pretty closely spaced so caution is needed in bigger rigs. Nice amenities and activities. Will stay here again. We camped at Thousand Trails - Palm Springs RV Resort in a Motorhome. This park was once a date orchard and spacing between sites is governed by where the trees are growing. Due to a drought situation, the sites are mostly dry (dusty) dirt and paved RV parking area. Staff is very helpful and friendly, but I thought this was an over-priced stop on our cross country trip. Sites are a mix of pull-thru and back-in and are not assigned, just offered on a first come, first served basis. We camped at Thousand Trails - Palm Springs RV Resort in a Fifth Wheel. If you're looking for luxurious sites with plenty of room for tents and toys, this place is going to be tough for you. If you want to be in the Palm Springs area and be surrounded by date palms, this is the spot. We've stayed here a few times with our Thousand Trails membership. When you enter the park, sites to the right are back-ins and are 50amp FHU. Sites to your left are pull thrus and 30 amp FHU. We've stayed in both sections and like them equally. There can be road noise as the park is beside the interstate. If you're off the road a little, we've found it not to be a bother. We never used the pool or spa. The bath houses are nice. The staff has always been super nice to us. We camped at Thousand Trails - Palm Springs RV Resort in a Fifth Wheel. large park, lots of palm trees, lots of dusty sand. nice and roomy between spaces, more than normal. "gated" security which is nice. everyone seemed to abide to quiet times in our end of the park which was on the varner road end. very high traffic noise from main highway both day and night. train noise several times each night which was louder than the vehicles. we know why the opposite end of park was full; alot further from the noise. we will stay here again if we can get on quiet side. We camped at Thousand Trails - Palm Springs RV Resort in a Travel Trailer. We've stayed here before and will stay again - it is one of our favorite campgrounds. We love the trees, the hiking in Palm Springs and the delightful sunshine and warmth. Do the trees present a bit of a problem with parking? Ah, you have to watch them but most people I noticed didn't have any problems parking. If you're concerned, try the pull-thru section on the left hand side. Pull-thru have 30A, back-ins have 50A. There are lots of activities but most people seem to be enjoying their own. The pool was filled the several times we walked by, the library is nice and has lots of choices and the bathrooms are always clean. Shopping is nearby and the entry-exit from Rt 10 is very easy. Yes, there is more dirt and sand than usual but it is a drought in southern California and has been for several years. And, yes, the sand will filter in through your closed windows if it's breezy. There. We camped at Thousand Trails - Palm Springs RV Resort in a Motorhome. If you like to hike, try the Ladders hike in Mecca. It's fun, not too challenging and a nice slot canyon. It will require a bit of agility though. 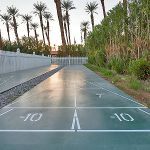 The Thousand Trails Palm Desert resort is convenient to the freeway and to shopping and activities in the area. There are also lots of activities to do at the resort. Because of the drought, there is no watering of the grass and as a result, what little grass there is seems to be turning into sandy areas. If high winds are predicted, be sure to close your windows as the fine sand will cover everything inside (and outside) - and some will come in even with windows all closed! The palm trees are nice to have in the park, though they do contribute to challenges in getting parked. We parked in one of the pullthru sites which are to the left as you enter the park; we didn't think our 43' motorhome would fit in the back-in sites on the other side of the park. If you have a long rig, you may want to particularly look for a site in the row (or rows) that have 3 palm trees across, versus the ones with 2, as they are significantly deeper. We tripped the breaker at our site on a Sunday afternoon and couldn't get it reset. A call to the ranger station brought someone over immediately and he changed out the electric hookup in just a few minutes. We camped at Thousand Trails - Palm Springs RV Resort in a Motorhome. We needed some parts to repair a couple of things on our rig and one of the other guests at the park recommended that we go to Blair Station. It was quite an interesting shop, and I think he probably has about any RV part or supply that you might need! For snowbirds who are Thousand Trails members, this is an excellent value for a place to escape winter. Not sure how I would feel if I had to pay a premium to stay here, though. The spots are close together, and always full. There are more people in this park than I have ever experienced at a TT park - always very busy. If you're the social type who likes to meet lots of people and join in activities, it's a great place. If you're claustrophobic, like being alone, or have a large rig, I'd keep looking. On walks I saw large class A's practically shoehorned into the back-in sites. I loved the palm trees more than I thought I would. There are lots of them, and some fruit trees, too, which the park encourages you to pick. What isn't paved or asphalt is sand. Not a big deal. At other parks it's dirt (or mud! ), gravel, or pine needles, all of which will track into your rig, so I don't know what others are complaining about. The Pros: Perfect Verizon service, really well-maintained hook-ups (if awkwardly placed - first time I've ever needed a power cord extension), sparkling rest rooms, several pickle ball courts, awesome weather in January, great view of snow-capped mountains, UPS and FedEx delivery direct to your site, friendly staff who bend over backwards to help. The Con: OMG, SO noisy at night! Not the campers - this is the usual quiet, considerate TT crowd I'm used to at all the other parks. But there just is no escaping the traffic noise. At the suggestion of the ranger, I parked all the way in the back of the park, but the freeway just never sleeps. I'm probably more sensitive to this than some others, because I've never lived close to a busy road, but even with all my windows closed, I can still hear it at night. I rated this an 8 instead of a 10 just for that reason. I will come back here for my required time out from the park I consider my winter home, but this would not be it. We camped at Thousand Trails - Palm Springs RV Resort in a Motorhome. This is one of the "nicer" Thousand Trails parks in terms of amenities - nice clubhouse and pool - but sites are very tight. Lovely tall palms throughout the park. Very fine dirt mixed with gravel gets into everything (it's a windy area). My Verizon worked well. Close to shopping, casinos, galleries. We camped at Thousand Trails - Palm Springs RV Resort in a Fifth Wheel. This is a nice park. It is very open. A few of the pull through spots have some foliage, The back in spots are set up with a couple of Palm trees between each spot. The spots are foot sized. The vehicle is backed in on sand, then there is a concrete 'patio' and an additional pad next to that for the picnic table. The pull through spots parked on concrete. The back in spot had 50 amps as well as 30. It looked like most the back in spots sported 50 amps. The staff is very cheerful and friendly. They were very helpful. I did not use the pool, however I saw them cleaning/servicing it in the morning when I took my walks. It looked very clean! In the evenings sometimes the wind picked up, coating everything in my motorhome with a fine layer of sand/dust. The road noise and train noise was pretty prevalent towards the front of the park. At the back of the park it will still audible, however not loud enough not disturb normal conversation. It was not crowded when I was there. They close for the summer and I was there the week before they closed. Overall, I like this park. We camped at Thousand Trails - Palm Springs RV Resort in a Motorhome. Joshua Tree National Park is a nice day trip. All 50 amp sites are very tight due to date palm trees. These sites are on dirt but level. Many 30 amp pull thru sites are very large and paved. This park is on the frontage road of I-10 and front sites have noise from highway but it is tolerable. One pool is used heavily and by the end of the day the water is green. Not appealing. We experienced temps in mid 90's and winds. As a result the fine dust got into everything. We camped at Thousand Trails - Palm Springs RV Resort in a Motorhome. 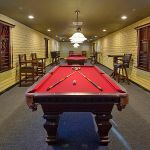 The location is close to the Tram at San Jacinto Mt, Joshua Tree NP and major tennis and golf venues as well ad all major shopping and casinos. There are two sides to the campground: one side that is all back in sites with 50amp service and the other side with all pull through sites and only 30amp service. The sites are narrow and the Palm trees make it extra difficult to get into the sites. There is a nice picnic table and grill at each site but everything is so close together that it feels like you're in your neighbors area if you use them. We picked a site that was towards the front which means we were closer to the freeway and train tracks. Even inside the RV we could hear it. The trains weren't whistling but hearing them go down the tracks was loud. From our walks around the campground we noticed that about halfway towards the back you can't hear them. Everything was very clean, the people very friendly and the pool very nice with covered cabanas and lounge chairs. The only shade was from the RVs. We will be back as its only an hour from home and makes a nice weekend getaway. We camped at Thousand Trails - Palm Springs RV Resort in a Fifth Wheel. Entrance to park is on the I-10 service road, so freeway noise is a given. Across I-10 is a busy train track that has plenty noise of its own. Park is quite small, but noise is less in the back. From the freeway, you see the hundreds of tall palm trees and wonder how in the world this could be an RV park. The back-in section to the right is 50 amp, but lots of big rigs opt for the 30 amp pull thru section to the left, due to the tightness of maneuvering around the palm trees to back in the 50 amp sites. However, when the temps reach the 90s, you'll want 50 amp service. Sites are sandy, and when the wind picks up, the sand blows. Some folks have complained about sand damaging the slide out mechanisms on their rigs. The pool area is nice, but small for the amount of use it gets. The grassy areas and flowering plants around the park are lovely, but require precious water. No ugly annual sites to complain about here. They are small but well maintained. Very nice pickle ball courts. And, of course, lots to do in the Palm Springs area. Many nice dog parks fairly close by. We camped at Thousand Trails - Palm Springs RV Resort in a Fifth Wheel. Nice Thousand Trails (member rate applied). Everything is top notch except roads and sites are tight. We camped at Thousand Trails - Palm Springs RV Resort in a Motorhome. Sites are VERY tight. Streets are narrow, and palm trees separating sites make backing or pull through sites difficult to get in and out of with a 30' trailer. If windy, sand storms can kick up. After a morning of sand storm activity, we had 1/2 an inch of sand/dirt caked on our truck/trailer. Our shore plug post arced when plugging in, so the maintenance man came (within five minutes!) to fix it, and we were good to go. At the back in sites, we couldn't use as our electric plug cord wasn't long enough to plug into the shore plug (which is located at the back of the sites). Pull through sites have the shore plug set up on the side of the sites. Due to freight train traffic and I-10 noise, it's best to try and get a site as far north in the campground as possible. If you choose a site close to the freeway, it's definitely noisy. Because of the above, we rated this park an "8". Otherwise nice park with very active residents/campers (daily activities). Newly remodeled bathrooms with great water pressure in showers (so we just used their bathrooms). Very friendly staff! Close to shopping. We used our Verizon smartphone 'hotspot' for wi-fi, and had no problems staying online. 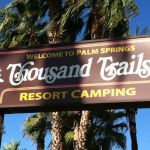 We camped at Thousand Trails - Palm Springs RV Resort in a Travel Trailer. There are a number of things to do, they are all 30 minutes or more away. There are a number of grocery stores within 20 minutes or so. To much to list Go to the College of the Desert they have a flee market on weekends El Paseo shopping Of coarse Palm Springs we never did get to the Palm Springs tram ride but hear thats worth the time I guess that's for another trip. Arrive early to get the best site. The city of Palm Springs is quite a long drive but there are several nearby cities with full tourist facilities. Walgreens, slater bros. true value. Bike shop and Thrift stores! Walmart, not too far away, lots of stores to choose from. 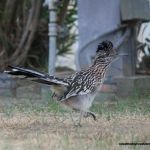 Things to do are day trips to Joshua Tree National Park, Salton Sea, Borrego Springs, Metal Sculptures, Slots, jeeping trails, hiking, shopping, farmers markets. Are you affiliated with Thousand Trails - Palm Springs RV Resort ?